In a year when Canadians will be focused on winter sports excellence, Canada Post is shining the light on three history-makers and record-breakers. Each woman honoured in this set of stamps has changed the face of her sport and left an indelible mark on the memories of her fans. Louis Gagnon, Creative Director and Partner with Montréal’s Paprika, explains that the three stamps were designed to have a classic memorial look. "The illustrations represent the athletes in full action, which contrasts with the simplicity of the design," he says. "The vibrant, powerful style reflects the prowess of the three champions. The setting features an element that reminds us of the athlete’s sport – and the colour scheme is influenced by the colours of the Olympic logo." According to Stamp Program Manager Elia Anoia, both the production process and the final result are also dependent on the cooperation and involvement of the families, foundations and archives that act as keepers of the memory of the women recognized here. "This can be an emotional process for the family, particularly if the loss is a recent one. We hope that it’s a positive and healing experience, a chance to remember the best of times – the families are thrilled by the fact that we are honouring these Canadian women with a stamp." Known as "Canada's Sweetheart," Barbara Ann Scott has inspired generations of Canadians to lace up and brave cold outdoor rinks to perfect their spins, jumps and figures. 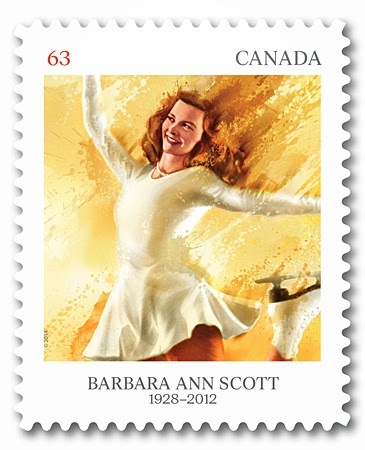 Early in her career, Scott won countless national and international prizes, then captured the gold medal in the women’s singles figure skating event at the St. Moritz 1948 Olympic Winter Games, in Switzerland – a feat no other Canadian woman has achieved since. The Official First Day Cover (OFDC) depicting her graceful style is cancelled in her hometown of Ottawa, Ontario.